1. Confession on Wednesday! How awesome is this from Bishop Farrell? I have asked every parish in the Diocese of Dallas to have their doors open on Wednesday, April 4th, from 6:30-9:00 p.m. to welcome anyone seeking the Sacrament of Reconciliation. Whether it is someone who has been away from the Church for awhile or a Catholic who attends Mass regularly but has not gone to confession in some time, we invite them to take advantage of this special night. This initiative, called The Light is On For You, originated in the Archdiocese of Washington, D.C. during the time that I served as auxiliary bishop there, so I saw first-hand how successful it was and how meaningful it could be in the lives of the faithful. Because of that, I asked our priests and ministry leaders to make this evening available here in our diocese. A light in the window is an ancient sign of welcome. Jesus will be waiting for you. No reservations are needed. 5. Easter Sunday! : Holy Mass followed by a hunt for the ALLE----- the word we can't say right now and Easter baskets, Resurrection Rolls or Easter Nest Bread (haven't decided yet), dinner of ham, potato salad, rolls, and steamed green beans with Icebox Eclair for the kids (ignore the low fat stuff) and Pina Colada Pound Cake for the grownups! This year's eggs, starting with the deep maroon one in the 12 o'clock position and moving clockwise are: red onion skins, sweet onion skins (which I thought were yellow onions, but aren't actually), red cabbage with baking soda, red boiler onions, red cabbage (no baking soda), wrapped in red cabbage leaves while soaking in red cabbage juice, boiled in beet juice, and wrapped in boiled red cabbage leaves without juice (in the middle). We have been dying eggs naturally for a few years now all the while still having some fun with food coloring here and there. I'm not THAT green! This year, we kept our dyes simple, but experimented a little with technique. While I am by no means a natural dyed eggspert, I have learned a few things here and there that I can share. 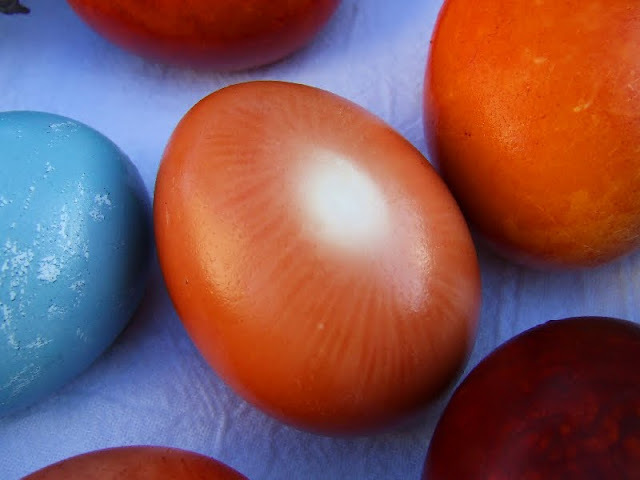 These eggs were cold dyed only. I boiled the eggs in plain water and let them cool. Then I reserved extra liquid from the dye baths and let that cool. 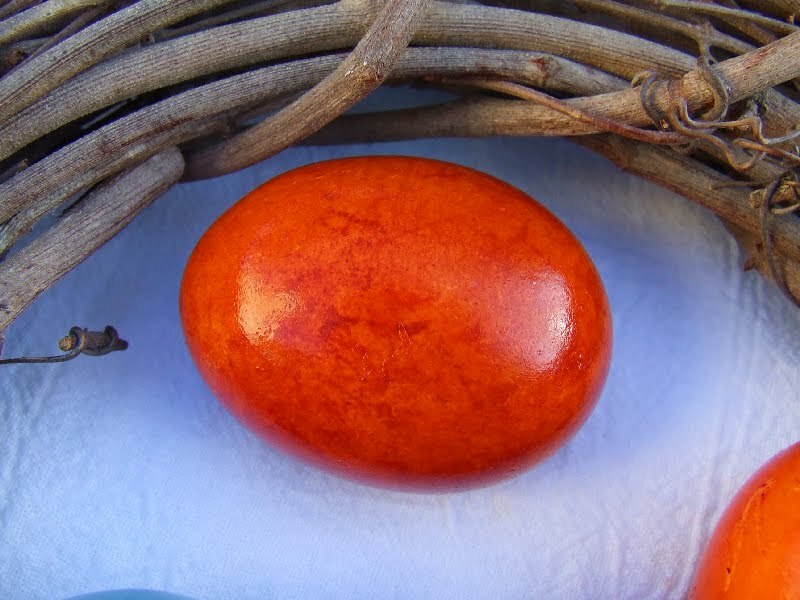 When both were completely cool, I placed a pre-boiled white egg in the dye baths and put them in the fridge overnight. The first thing you must be committed to accepting, if you are going to try to go au naturale with your eggs... nothing is guaranteed. Just like in nature, uniformity and evenness are very hard to find. Most things are random and a little odd. Everyone loved the markings on this egg. That is not a glare in the center, but rather a white spot that formed where the egg sat on the bottom of the cup, I suspect. I'm not sure what created the streaks of color surrounding the white spot, but I like it! The other thing you have to embrace is that this is a long process. No instant gratification here! 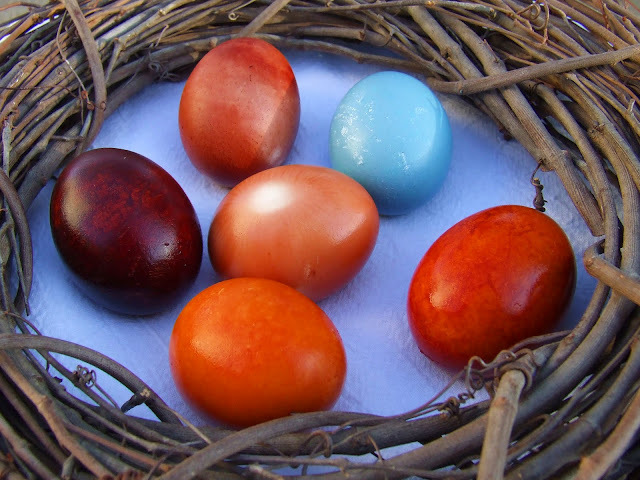 Get the kids to write out their predictions, leave the eggs in their dye baths overnight and see how well everyone predicted in the morning. As I have said before, we view it as part Easter fun, part science experiment. This one had the best marble effect. It was cold dyed in sweet onion skin juice overnight. Also, if you want a lot of onion skins, but not a lot of onions, ask the produce manager if you can clean out the onion trays. They just might be happy to oblige! You get all the onion skins you want, they get some free labor. Win win! Oh yay! I was sick when our parish did the big confession party and was worried I missed my window. Whew - thanks for the link. How wonderful your bishop asked this. We are blessed with a parish that offers confession half an hour before every weekend Mass and after every daily Mass. I have seen the lines go out the door on first Fridays. On Good Friday last year, our priest arranged to have 10 confessors for almost 5 hours. There still were people in line when the priests had to leave. He asked our parish regulars to go early in the week so no one has an excuse not to go to confession. We count ourselves immensely blessed to have such a parish so close to us. Hope your family has a very blessed Holy Week! I've been procrastinating about confession and then tried to go but was too far back in line...I am so mad at myself now. How about that weather this afternoon - I was including y'all in my prayers. That is awesome about your bishop! I hope that the times are full and that they'll consider adding more confession times normally. Here in my diocese, the confession times at most parishes are by appointment only. I am very familiar with that homily and I respect Father's thoughts regarding what some people refer to as a Catholic or Christianized or Messianic Seder Meal... but that is not what we do at all. In his homily, Father refers to a publication that specifically references coming to a Seder meal not as a history lesson. But a history lesson is exactly how we approach our Passover inspired meal. Father refers to the difference between Biblical Judaism's celebration of the Passover vs. Rabbinical Judaism's celebration of the Passover. Our meal is a very minimalist biblical history lesson (and probably very poorly done because my kids are picky eaters) on the foods that Christ might have eaten with his disciples before departing for the Garden of Gethsemane and on to His Passion and it has become our traditional meal for the day. It is not a reenactment of the Last Supper and it certainly is not our version of Mass at home. We do not consider it a religious celebration. We don't participate in any rituals except asking God's blessing before we eat as we do every meal. Bless us O Lord and these They gifts...We do not even discuss the history of the Jewish celebration of Passover except so far as it is mentioned in the Gospels. So, I sincerely thank you for your concern, and after listening to Father's homily again, I am once again certain that our Holy Thursday meal in no way puts our immortal souls in jeopardy (gluttony aside! :) either objectively or subjectively any more than choosing to eat a meal inspired by Ancient Greek cuisine would. I believe Father is speaking about an eccumenical outreach program that perhaps overstretched its boundaries and became a tradition in some parishes and homes when it probably shouldn't have. As a priest and pastor he has every right and duty to do that and I applaud him for taking his responsibilities seriously. Some people choose to eat lamb on Easter, we choose to eat it on Holy Thursday. It makes Good Friday fasting and abstinence that much more difficult, especially for my teenage son who really enjoys lamb roast! 1857: For sin to be Mortal, three conditions must TOGETHER be met: Mortal sin is sin whose object is grave (serious) matter and which is also committed with FULL knowledge and DELIBERATE consent.